Digital photography is great. No more waiting for turn around time with developers or messy chemicals to play with. And you can see what you shot right away on your LCD screen. Shoot away–the only limitation is how many gigabytes of memory available. Another positive difference is that you no longer have to go through shoebox after shoebox to find the photo you are looking for. Yep, digital photography rocks! And yet, there is still something about a print. No matter its size, a print is something special, something tangible, something unique. When you hold a print in your hands you hold a memory, a moment frozen in time forever. There it is right in front of your eyes. You see it but you still can hardly believe it. Precious time frozen in beauty. Touch it, hold it, stare at it. And if you are the photographer who created this photo that’s even better! Sadly, far too many prints are in laptops, computers, external hard drives, and Drobos never able to see the light of day. They are stored digitally and even viewed digitally. It is like they are doomed to a digital existence for all of eternity. No! Even digital photos deserve to be printed. So go ahead, print some of your photos. Hold them in your hands, touch them, stare at them. And then you will realize that there is something mighty precious about a photograph! Teamsake… that’s an odd word. What is a teamsake anyway? You’ve heard of keepsakes, but what in the world is a teamsake? I enjoy sports photography and have been photographing sports for a long time. It really doesn’t matter which sport to me, I enjoy it all. Action, movement, and competition get my creative juices flowing and I thoroughly enjoy the challenge of attempting to capture the sports action with my camera. I was fortunate to be a baseball and football coach for over nine years. I do miss coaching, but now have utilized the skills I learned while coaching in my photography. This helps me prepare to aim my camera at the upcoming action and knowing the game I am photographing is immensely helpful. I am the photographer for the Lehigh Valley Baseball Academy in Bethlehem, Pennsylvania. This entails photographing games, player & team portraits, the facility, and any other subject the owners request. The players and parents enjoy seeing the action shots and the portraits, while the coaches like the action shots because they can see the mechanics of the players. I am always trying to offer something new and interesting for the players. Enter the teamsakes. 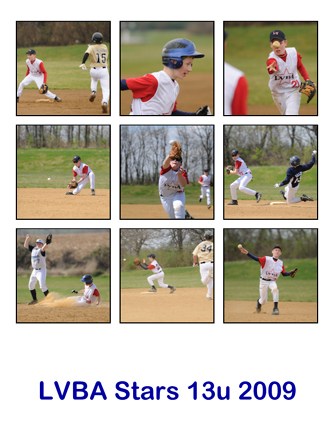 A teamsake is a collage of nine action photographs of one team. A player can choose any nine photos he wishes. He can include photographs of himself and his teammates to build a teamsake that will help him remember his team whenever he looks at this collage. You can view the sample teamsake below to see what I am talking about. Each teamsake is only $15 and provides a keepsake for your season. Teamsakes make great birthday and Christmas presents, too. One of the great things about photography has always been sharing the photographs with others. Whether you are a beat photographer for a daily newspaper or an amateur on a family vacation, you just cannot wait to get the photos out for people to see. Years ago this took some time. First the entire role of film had to be exposed and then the film had to be sent out to be developed. All the while you were waiting impatiently to see how they turned out. This lapse of time was the main reason that the Polaroid camera was such a success. After snapping the photo you only had to wait a few short minutes to see the photograph. Today we have a variety of ways to share our photos with others. We can burn a cdrom, send the photos by email, post them on our website or Facebook page. The time lapse has been almost completely removed with digital images now instantly available for viewing. Still, far too many photos are sitting on hard drives never to see the light of day or even be shared with others. The digital age has helped us take more photos but I fear that it also results in far more photos never being shared with anyone. So be sure to share your photos with others. Print them out, post them on the internet, or send them to friends by email. Whatever you do, be sure to share your photos with others! Today I just picked up some 11″ x 14″ prints that I had ordered plexiglass face mount prints for a photo exhibit. I have had plenty of digital photos printed before, but only one or two of this size. 11″ x 14″ prints show a lot of detail and make for beautiful prints. The photos I had printed are all wildlife subjects: elk, deer, and birds. To see the hairs of the hides and the plume of the feathers on these photographs is absolutely amazing! If you haven’t printed a large print, you really need to give it a try. Take a few of your favorite photos and print them or have them printed by a professional photo lab. See how larger photographs look and then share them with others. I am looking forward to getting my photos into frames and seeing the finished product. There just something about a physical print that is unlike anything else. Computer images and digital frames are okay and easy to share, but large physical prints are something else. I believe that photos were meant to hang on walls and be seen by people. I am eager to share these prints with others. What about you? Do you have photos to share? How do your large prints look?